Rubén Valladares points to one of the printed bags he has made in his Havana workshop. His private company sells the bags to many Cuban state-owned companies. HAVANA - Rubén Valladares just might be one of the most important entrepreneurs in Cuba. No, he’s not a tourism tycoon. He’s not a tech titan. Truth is, he makes…paper bags. “But we are the biggest provider of bags in Cuba,” says Valladares, a slender, middle-aged man who finishes his sentences with the sort of raspy chuckle that helps people get through each trying day on this island. Valladares is especially proud of the gift bags he made up for President Obama’s historic visit to Havana this week. They sport Obama’s face between Cuban and U.S. flags with a message in English: It’s Time. Welcome to Cuba. Bags this nice don’t pay for themselves, after all. That’s the sort of business acumen that changed Valladares’ life four years ago. He was a middle manager making a middling salary at a state-run Cuban firm printing business cards. One day a shop owner picked up his order and mentioned he couldn’t find anyone in Havana who could print his logo on sturdy paper bags. “That guy, he made the idea for me,” says Valladares – who had one of those capitalist epiphanies you see a lot more of in communist Cuba today. The demand overwhelmed them – and so did the money that poured in. As in, 20 percent annual revenue growth. Valladares recently bought his family’s first car – a shiny pink, Russian-made Lada 1600. He has almost 30 employees, most of whom earn three or more times the $20-a-month most Cuban workers make. They also get benefits like family leave. Adorgraf still has just a modest workshop that sits on an unpaved street near Havana’s airport. But to understand why the company is a player, check out the wall inside, where Valladares displays bags with his clients’ logos. Most of them are large, state-run firms. And that matters a lot to Cuba’s fledgling private sector. Today in Cuba there are half a million private business owners, or cuentapropistas. Not long ago they were just considered folks making a few extra pesos in the island’s threadbare economy. But today they account for almost a quarter of Cuba's economy and employ almost a third of its workforce. And the fact that the state is now a cuentrapropista customer means private ventures have assumed a much more essential role. “It’s an important psychological step,” says Augusto Maxwell, a Cuban-American attorney who heads the Cuba practice at the Akerman law firm in Miami. Maxwell is in Cuba this week during Obama’s visit – and he says a big question now is whether the entrepreneurs’ new clout might lead to more free-market reforms. “That’s a conversation between the Cuban entrepreneurs and their government,” he says. And it’s not any easy one. “Oh, it is very complicated for us,” Valladares tells me with a more exasperated chuckle. So complicated that he has to stop speaking English and explain it in Spanish. For example, he points out: The Cuban government still won’t let private businesses buy materials directly from the wholesale market. It’s a power thing. So when Valladares needs paper from the state-run wholesaler to fill orders for bags, his clients have to buy the paper first. Then he buys it from them. It doesn’t make sense in Spanish, either. Which brings us to why Valladares printed up all those bags welcoming Obama – who is arguably the biggest champion of Cuban cuentapropistas. In fact, Obama just took another step toward that end. Only Congress can lift the trade embargo against Cuba. But last week the U.S. issued new rules that let private Cuban firms buy and sell with America and access credit there. 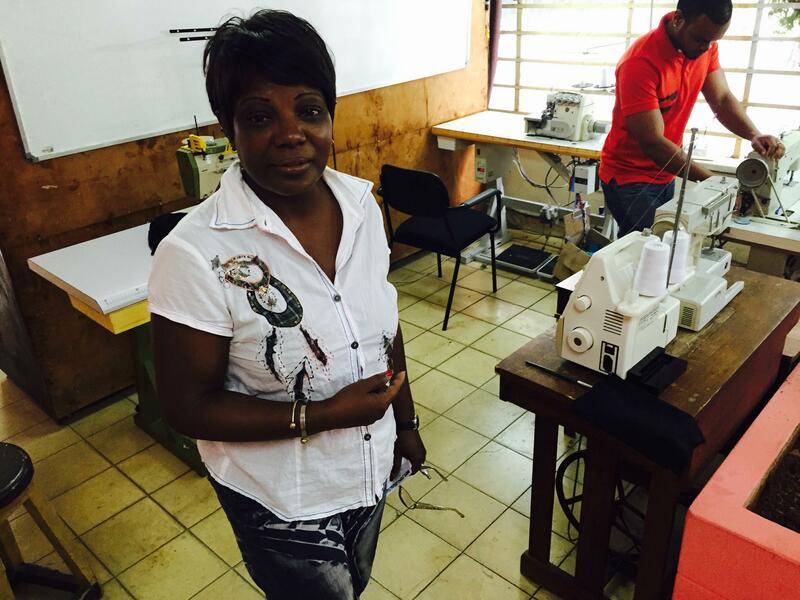 Cuban entrepreneur Caridad Limonta (left) who owns a clothing firm called Procle in Havana. Her son Oskar (right) will attend a business training course at Florida International University this summer. Maxwell says that puts the ball once again in the Castro government’s court. But entrepreneurs like Valladares really aren’t waiting to find out. And neither is South Florida. That’s where Valladares last year hooked up with a Hialeah printing company, Florida Flex. “We are importing from Hialeah,” he says with a sly grin. For months now Valladares has been engaged with Florida Flex in what cuentapropistas call Samsonite importing: Bringing raw goods – like silkscreen printing ink and equipment – from Hialeah to Havana in bulging suitcases and boxes. Florida Flex, which is owned by Cuban-Americans, is also poised to bring some of Adorgraf’s employees up to Hialeah and train them in more advanced skills. It’s that kind of, well, enterprising spirit that keeps Adorgraf’s workshop humming. And it earned Valladares an invitation to Obama’s event with Cuban entrepreneurs in Havana, where the President gave them a pep talk. That seems as plain as a paper bag. HAVANA - Elizabeth Duconge says she has quadrupled her income in the past two months. She had been an art curator in Havana. Now she works at a paladar in the Vedado district here. Paladares are privately owned restaurants and some of the most visible reforms of the Cuban economy. Duconge said she makes $30 Cuban pesos a week waitressing at La Moraleja. “I didn’t have a way to support myself and my family,” she said a few hours before President Obama arrived in Cuba on Sunday. “I started to work here and it changed. Now I can help my family and support myself. HAVANA - President Obama is betting that business owners will be engines of change in communist Cuba. Especially millennials. Two of them will meet the President on Monday in Havana – and then head to Miami this summer for more intense biz training. Oscar Matienzo is a 25-year-old Afro-Cuban with a sharp head for fashion and computer marketing. He’s put both those talents to work for Procle, the private clothing business his family owns in Havana. One of the last vestiges of the Cold War was buried Sunday, when President Obama set foot in Cuba. He's the first American president to visit the island since Calvin Coolidge, 88 years ago. "Que bola', Cuba?" 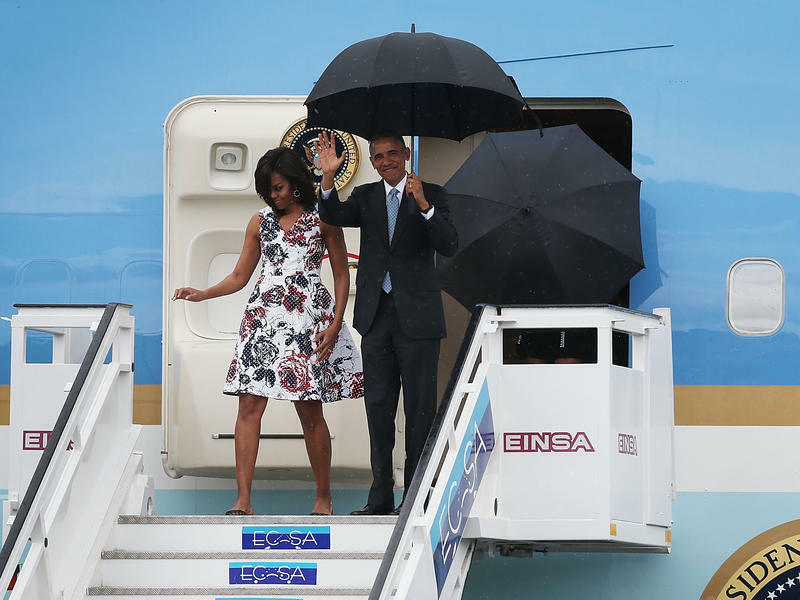 Obama tweeted in an informal greeting, moments after Air Force One touched down at Havana's Jose Marti Airport. "Looking forward to meeting and hearing directly from the Cuban people." HAVANA - Shortly before President Obama arrived in Cuba today, a human rights march turned into an ugly street confrontation - an incident that served to send Obama two opposing messages. The President's historic visit to Havana this week is largely focused on the opening of economic relations between the U.S. and Cuba. But Cuba’s communist government and its pro-democracy dissidents are making it clear he can’t ignore the island’s political challenges.